In the first week of January, my family are going to travel from Milan (Italy) to Innsbruck (Austria), then to Munich (Germany) and finally back to Milan (maybe via Switzerland). All the hotels are already booked. My original plan was to rent a car to travel between these cities, but just now I found out that: in order to drive in Austria during the winter, the car should use winter tires. Italy rental car companies, doesn't offer this option, so, I can't rent a car that has winter tires and consequently I can't travel to Austria by car. I know I have the option to travel by train, but sincerely, my first option is by car. So, does anyone know how can I handle this situation? Also, I'm aware that, in order to drive in Switzerland, the car must have the "vignette". Does have any option to drive via Switzerland with a rental car and not to pay the full price for the "vignette"? Snow chains - for better grip on snow or ice. They are usually attached to the drive wheels of the vehicle and must be fitted in pairs. This is the page in Italian, whereas this is the page in English. All of this makes sense seeing as some national roads and paying highways in winter are restricted to for traffic to winter-equipped vehicles only. "In winter" means from the 15th of November to the 15th of April. Whereas "winter equipped" means with either snow tyres already fitted, or snow chains in the trunk. This is regardless of road conditions: snow or no snow you must have winter-equipped your vehicle. 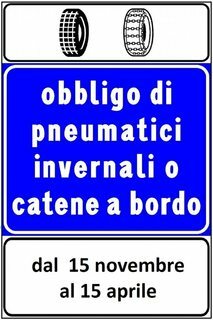 Please note that the Italian road police enjoys performing random checks in winter to fine unaware drivers. Don't be one of them. Please note that from 15 November to 15 April many cities are required by law to restrict the circulation to only vehicles equipped with snow chains or winter tyres. For a summary of the orders, please visit www.poliziadistato.it. To comply with the regulations, in central and northern Italian locations subject to this requirement, vehicles are equipped with snow chains - the price is included in the rental charges. At pick-up if you decide to bring your own snow chains or do not intend on driving on roads subject to this requirement, you may decline the equipment by signing the appropriate release form. This change will be reflected in the rental charges. For more information on the fees, please see below. In all other regions, we recommend that you check before renting if your journey includes one of the roads subject to this requirement and therefore request the snow chains. Hertz offers vehicles equipped with snow chains in the following Italian regions: Valle D’Aosta, Piedmont, Lombardy, Veneto, Trentino Alto Adige, Friuli Venezia Giulia, Liguria, Emilia Romagna, Tuscany, Umbria, Marche, Lazio, Abruzzo e Molise. In these regions, all vehicles are automatically equipped with snow chains for an additional fee of EUR 1.83 (including tax) per day with a maximum of EUR 27.45 (including tax) per rental. This price is included in your rental charges under the item Winterisation Fee. Hertz also has a FAQ page regarding winter tyres. This applies to you because you will be driving in countries where having snow chains in the trunk are not enough to be road-legal. Some countries offer a "Winter Tyre" car series which come, as the name suggests, already equipped with the tyres. Therefore they are included in the price of the rental. On a different note, if you travel on highways (A roads) you have no way around the vignette. In Switzerland you pay for a pass valid for 14 months: from the 1st December of the previous year to the 31st January of the following year. This means that a 2014 vignette is valid from 1st December 2013 to 31st January 2015. In Austria however you can get 12-month, 2-month, and 10-day vignettes, all at different costs, depending on your needs. In Austria (and in Germany! ), it's actually not mandatory to have winter tires or any form of special equipment if the road is in good conditions. The rule only kicks in in “winter conditions” (“winterliche Fahrbahnverhältnisse”), i.e. if there is actually snow or ice on the pavement. Except if you are driving in the middle of the night on a day with heavy snow fall, it should not be the case on the main motorways, even during the winter. As far as Austrian law is concerned, “winter tires” are not necessarily snow tires (with the “alpine” sign) but tires with the “M+S” sign, which is also the case for many “all-season tires”. You could check with rental companies if their cars have those. Alternatively, it's also possible to use “snow chains” instead of special tires but that's only allowed if the road is completely covered in snow. You do have to pay for the yearly vignette for Switzerland (Austria also has a vignette but sells short-term ones). Are you sure that the Italian car rental agency does not offer cars with winter tires? I really doubt that, because also in Italy it gets very cold in the winter and there will be snow on the roads. Maybe the cars have all year tires? Have you already talked to the car rental agency? Considering the vignette: In Switzerland you pay 40 Swiss francs for 1 year and you can't avoid that if you want to drive on the high ways. You could probably risk to drive without a vignette because checks are rare, but if you get caught, the fine will be quite high. Actually the fine is 200 Swiss francs, and you're required to buy a vignette for 40 Swiss francs on the spot. If you're lucky, the car already has a vignette from 2014. With a 2014 vignette you can drive on Swiss highways until 31. January 2015. Concerning Austria, you also have to pay for using the highways. The shortest amount for the road toll sticker is 10 days and it costs 8.50 Euros. Be aware that some parts of the highways still cost extra money, e.g. the Brenner Autobahn (the highway you're taking when going from Italy to Innsbruck), Hohe Tauern Autobahn, Arlberg Tunnel, Karawankentunnel, and so on. An important note about the Swiss Vignette: It is not legal to slightly stick the vignette to a car, remove it, and use it on another car. That said, unless you want to make a gift to the rental car company, make sure that they provide a car with Vignette, or that they reimburse you if you have to buy one. To avoid the Vignette, just don't drive on the highways (green signs, A- numbers). However, this will reduce your options to travel through Switzerland to Italy, because the two common routes (Gotthard and San Bernardino) are highway, and the passes are closed. The most likely open route would be (Landquart)-Klosters - Vereina tunnel car train - Engadin valley - Maloja pass - Chiavenna - (and further on), or … Engadin valley - Bernina pass - Tirano - (and further on). In any case, stay informed which routes are open; it may change from day to day, maybe even from hour to hour. And a final comment about winter tires: At temperatures below 7 degrees centigrade, they provide better traction than summer tires. And if you have an accident with summer tires when winter tires would be needed, the insurance may limit the coverage. Can you check with rental companies if they offer Snow Chains as an option? If not, you may buy them yourself (prices start from 50-60 euros). 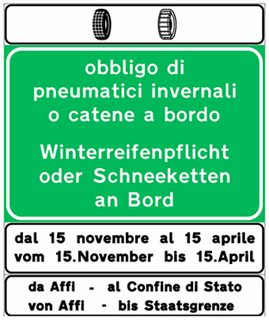 According to austria.info "Mandatory Winter Equipment" , you should be ok since winter tires or tire chains are required only if winter conditions arise. You can mount them at occurrence. Be aware that a "vignette" is required in Austria too, but is much less expensive than italian "pedaggio" on the "Autostrada". Not the answer you're looking for? Browse other questions tagged driving italy switzerland austria winter or ask your own question.